About 60 people protested the opening of "Hooters" in downtown Gainesville in late May. Here, Kat Smith walks past the outdoor area of the restaurant. 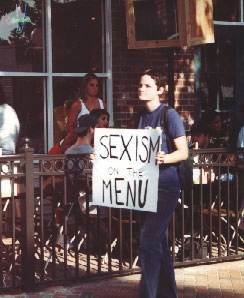 Protesters carried signs saying "Hooters Mainstreams Sexual Harassment,"and "Sexism on the Menu" to protest the fact that female Hooters employees are required to wear revealing shirts and tiny shorts so the corporate chain can make money off of male customers. In a letter explaining the protest, organizer Jessica Mills stated, "Because everyone knows that 'Hooters' is a popular slang for women's breasts, Hooters encourages the objectification of women. It's OK, and expected, for the male customers to ogle the waitresses and the ultimate effect is that the atmosphere at Hooters mainstreams sexual harassment." Hooters also came under fire as yet another corporate chain which will drive out of business the small food establishments downtown.